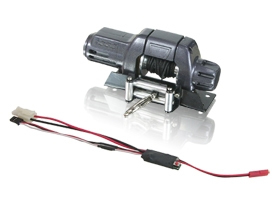 Complete 1/10th scale model winch for any crawlers with automatic pull and collect functions. Each winch set comes with one winch mount that can be easily attached to any crawler body. Replacement parts also available for purchase/repairs. Maximum tow weight is 1 kg.